Having been rewritten by official biographers, Saddam's official biography is hazy. It is known that he is born in the small village of Al Awja and that he leaves home at an early age. He arrives in Baghdad at age 10 to seek an education and to live with his Uncle Khayrallah, an Iraqi nationalist who had served time in for anti-British activities. During the 1950s and 1960s the Ba'ath Party is a small, underground Arab nationalist group that supports the creation of a pan-Arab state -- a popular idea to Middle East Arabs. At age 20, Saddam Hussein joins the party. Saddam is selected by the Ba'ath Party to be part of seven-man hit squad to assassinate Iraqi leader Gen. Abdel Karim Kassem. The plot fails. Although Saddam later portrays himself as the leader of the team, in reality he has a small role. He is slightly wounded in the incident and escapes the next morning in a daring swim across the Tigris River. Saddam flees to Cairo and becomes caught up in Egypt's own revolution under the charismatic Gamel Abdel Nasser, whose pan-Arabism Saddam finds appealing. Saddam also becomes a leader of the Ba'ath Party's student cell in Cairo and reportedly regularly visits the U.S. embassy to meet with CIA agents interested in sparking Gen. Kassem's overthrow. In February, Kassem is assassinated by members of the Ba'ath Party and the CIA helps the Ba'athists by providing lists of suspected communists for the party's hit squads, who kill an estimated 800 people. Saddam returns home and rejoins the party as an interrogator, torturer and killer. Nine months later, the army overthrows the Ba'ath Party and Saddam is jailed. He is said to have studied the political tactics of Hitler and Stalin while in prison. Again, the Ba'ath Party seizes power in Iraq, this time under Ahmad Hassan Al Bakr, Saddam's cousin. Bakr entrusts his 31-year-old relative with the most important job of all: running the state security apparatus to extinguish dissent both inside and outside the party. Within a year and a half, Saddam emerges as Bakr's right hand man. As Saddam's power and influence grows in the 1970s, it is clear that he has designs on the presidency himself. But he also knows that Bakr has powerful support from the army. Saddam begins to plot against the military establishment and to systematically remove Bakr's closest colleagues. Saddam stages a palace coup and President Bakr resigns for health reasons. Among Saddam's first actions after assuming the presidency is purging the Ba'ath Party of any potential enemies. Several weeks into his presidency, Saddam calls a meeting of the Ba'ath Party leadership and insists it be videotaped. He announces there are traitors in their midst and reads out their names. One by one, the individuals are led out, never to be seen again. Tapes of the meeting are sent throughout the country, allowing Saddam to send a message to the Iraqi elite. When Ronald Reagan becomes president in 1981, he endorses a policy aiming for a stalemate in the war so that neither side emerges from the war with any additional power. But in 1982, fearing Iraq might lose the war, the U.S. begins to help. Over the next six years, a string of CIA agents go to Baghdad. Hand-carrying the latest satellite intelligence about the Iranian front line, they pass the information to their Iraqi counterparts. The U.S. gives Iraq enough help to avoid defeat, but not enough to secure victory. Richard Murphy, U.S. Assistant Secretary of State, explaining to Saddam in 1986 how the U.S. had been selling arms to Iran. Public exposure of the plan -- which also involved illegally diverting the proceeds from the arms sales to the U.S.-backed Contras in Nicaragua -- leads to the end of the U.S. policy. However, when Saddam learns of America's actions, he vows never to trust the U.S. again. In the name of freedom of navigation, the U.S. throws the weight of its navy behind Iraq's position in the Persian Gulf. A large American armada protects tanker traffic and cripples the Iranian navy. A war, which at that point had been going against Iraq, is again transformed into a stalemate. Richard Murphy, the State Department's top Middle East diplomat for most of the 1980s, told FRONTLINE in 1990 that after the attack at Halabja, the U.S. expressed its dismay at Iraq's use of chemical weapons. He recalled that Secretary of State George Schultz persuaded the Iraqis to "articulate a position that they would forswear future use of chemical weapons." The end of the war comes with a ceasefire under conditions that reflect the U.S. government's best hopes. A classified State Department document states: "We can legitimately assert that our post-Irangate policy has worked. The outward thrust of the Iranian revolution has been stopped. Iraq's interests in development, modernity and regional influence should compel it in our direction. We should welcome and encourage the interest, and respond accordingly." By 1990, Saddam Hussein has the fourth-largest army in the world and his program to build weapons of mass destruction is well underway. However, after its eight-year war with Iran, Iraq is billions of dollars in debt and angry with its Arab neighbors about the low price of oil, its chief source of cash. In a speech celebrating the 22nd anniversary of his party's rise to power, Hussein threatens Kuwait and the United Arab Emirates. "Iraqis," he says, "will not forget the maxim that cutting necks is better than cutting the means of living. Oh, God almighty, be witness that we have warned them." April Glaspie, U.S. ambassador to Iraq, is summoned to meet with Saddam. According to an Iraqi transcript, Saddam harangues her about his dispute with Kuwait over oil prices. Ambassador Glaspie tells Saddam, "The president personally wants to deepen the relationship with Iraq." She expresses concerns about the Iraqi troops on the Kuwaiti border, but reflecting the official State Department position, she says, "We don't have much to say about Arab-Arab differences, like your border differences with Kuwait. ... All we hope is you solve these matters quickly." On the day of Iraq's invasion, President George H.W. Bush flies to Aspen, Colo. for a previously scheduled meeting with British Prime Minister Margaret Thatcher. She encourages Bush to "draw a line in the sand" not only to protect Saudi Arabia, but to warn Saddam that an attack on Saudi Arabia will be considered an attack on the U.S.
Less than 48 hours after the invasion, the U.S. and the Soviet Union issue an unprecedented joint statement condemning Iraq. On Aug. 5, Bush declares, "This will not stand, this aggression against Kuwait." In one of the president's rare speeches from the Oval Office, Bush announces his decision to send U.S. troops to the Gulf. He emphasizes that the action is defensive and that he is banking on sanctions to force the Iraqis from Kuwait. "The United States will do its part to see that these sanctions are effective and to induce Iraq to withdraw without delay from Kuwait," he says. "America does not seek conflict, but America will stand by her friends." Because of Soviet support, the U.S. -- for the first time since the Korean War -- is willing and able to use the United Nations to organize world support against the aggression. In the first five weeks of the crisis, the Security Council adopts five tough resolutions against Iraq. By mid-October, polls show that although a majority approve of the president's policy in the Gulf, support is slipping. 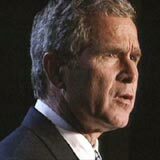 Bush is confronted by protestors at a campaign rally in Iowa and the first organized nationwide anti-war marches of the Gulf crisis are held. The president announces a doubling of the number of U.S. forces in the Persian Gulf "to ensure that the coalition has an adequate offensive military option, should that be necessary to achieve our common goals." On Capitol Hill, where support for the president's policy had been strong throughout the first three months of the crisis, the president's surprise announcement is immediately criticized. The administration soon realizes that a U.N. resolution authorizing the use of force against Iraq would help mute congressional criticism. Secretary of State James Baker personally conducts the last minute lobbying at the U.N. to convince the Security Council to authorize the use of force if Iraq does not leave Kuwait by Jan. 15, 1991. "Simply put," he tells the Security Council, "it is a choice between right and wrong." President Bush invites the Iraqi foreign minister to Washington and offers to send Secretary Baker to Baghdad. The Iraqis immediately accept the offer, subject to an agreement on the timing of the meeting, and a few days later, Saddam announces that he is releasing all foreign hostages immediately. Throughout December, the U.S. and Iraq squabble over the dates for the meeting. The meeting between Secretary of State Baker and Iraqi Foreign Minister Tariq Aziz lasts for six hours; however, the two sides fail to agree on a peaceful resolution to the crisis. Read a chronology of the Gulf War. Saddam's forces soon attack the rebels, who are not supported by Washington, which had decided against backing an uprising that might lead to Iraq's breakup. The rebel forces are hopelessly outgunned. As Kurdish cities are shelled, there is panic among the population. The cities of Kurdistan empty and a million people head towards the mountains in an attempt to reach the safety of Turkey and Iran. Again, U.S. forces, who see the exodus, are ordered not to intervene. Saddam's brutality and America's failure to support the Shia and Kurdish uprisings deeply affects a group of neo-conservative thinkers in Washington, including Richard Perle, William Kristol, and Under Secretary of Defense for Policy Paul Wolfowitz, who complains that the U.S. inaction is comparable to "idly watching a mugging." In 1992 Paul Wolfowitz takes the lead in drafting an internal set of military guidelines -- "Defense Planning Guidelines" -- which is prepared every few years by the Defense Department. Controversy erupts after the draft is leaked to the press. The Bush White House orders Defense Secretary Cheney to rewrite it. In the new draft there is no mention of preemption and U.S. willingness to act alone. As a result of the resolution, Saddam stays in power, but economic sanctions remain. Saddam must destroy his weapons and allow inspection of all weapons facilities by a U.N. special commission, known as UNSCOM. Iraq is given 15 days to provide a list of its weapons of mass destruction. Read a detailed chronology of UNSCOM inspections. On one of UNSCOM's first assignments, inspectors demand access to an Iraqi military facility. The base commander will not allow inspectors into the building, but lets them climb onto a water tower, where inspectors spot Iraqi trucks slipping out the back gate. Although U.N. vehicles catch up with the trucks and try to pull them over, the Iraqis refuse to stop and fire warning shots at the inspectors. However, the inspectors obtain photographs showing the trucks are carrying calutrons -- giant iron magnets that can be used to enrich uranium. In a surprise raid on an Iraqi government building, UNSCOM inspectors, led by David Kay, discover a hidden archive of documents that reveals Saddam's plans to develop a nuclear weapon. Incensed by the inspectors' discovery, the Iraqis haul off the original documents, and demand the inspectors turn over their photographs of the documents. The standoff lasts for four days and the weapons inspectors are held hostage in the parking lot outside of the building. They are finally allowed to leave with their evidence when the U.S. announces it will intervene militarily on behalf of UNSCOM. In the summer of 1992, UNSCOM tries to launch a major inspection at the Iraqi Ministry of Agriculture, but is stopped by Iraqi officials, who claim the inspection is a violation of Iraq's sovereignty. The inspectors wait in the parking lot for advice from the Security Council but receive no response and leave when their security seems threatened. Stymied by the Security Council, UNSCOM decides it needs a new approach to hunting down Iraqi weapons. It decides to act more like an intelligence agency, and one of its most important tools becomes U-2 planes, which are used to collect surveillance photos over Iraq. U-2 photo analysis helps, but on the ground inspections continue to be frustrated by Iraqi concealment. When UNSCOM arrives at a suspected weapons site, it's invariably empty. The Iraqis insist they are no longer concealing any banned weapons and suggest UNSCOM's work is done. Read more about assassination attempts by Saddam and the U.S.
Hussein Kamel, a high-ranking Iraqi general -- and one of Saddam's sons-in-law -- announces in Jordan that he has defected with his brother and their wives. Kamel had been in charge of hiding Iraq's weapons of mass destruction and he tells the chief U.N. arms inspector of a vast arsenal of weapons UNSCOM had failed to find and where the cache is hidden. The inspectors raid Al Hakam, which Kamel had described as Iraq's top-secret germ warfare production facility. The Iraqis had denied having any biological weapons programs, but there UNSCOM discovers Russian-built fermenters used to produce anthrax and growth medium used to grow biological toxins. The inspectors bury 17 tons of it and blow up the entire facility. Nine months later, Kamel accepts Saddam's guarantee that he can safely return to Iraq. The moment they cross the border, Saddam's two daughters are separated from their husbands; Kamel and his brother are killed several days later. Read experts' analysis on the significance of Hussein Kamel's revelations. Following Kamel's revelations, U.N. inspector Scott Ritter tries a new tactic, which becomes known as "shake the tree." Its purpose is to find out how Iraq is concealing its weapons. First, inspectors arrive unannounced and stir up the Iraqis, while at the same time, high above, a U-2 plane photographs the raid, trying to spot any suspicious Iraqi movements. On the ground, the inspectors monitor Iraqi radio traffic using radio devices provided by the CIA. This tactic, however, causes some to worry about the collaboration between UNSCOM and the CIA. In September 1997, UNSCOM inspector Dr. Diane Seaman leads a surprise inspection of an Iraqi food laboratory suspected of housing biological weapons work. Entering through a back door, Dr. Seaman catches men running out with briefcases that contain records of biological weapons activity on the stationary of the Iraqi Special Security Organization (SSO) -- the organization that guards Saddam Hussein. That night, UNSCOM attempts to inspect the SSO offices but is blocked. In order to marshal public support for U.S. military strikes against Iraq, Secretary of State Madeleine Albright, Secretary of Defense William Cohen, and National Security Adviser Samuel Berger attend a town meeting at Ohio State University. The three are confronted by angry audience members and it becomes clear that the U.S. does not have domestic support for a war against Iraq. U.N. Secretary General Kofi Annan travels to Baghdad and negotiates a compromise in which Saddam allows the inspectors to return to Iraq, but restricts their access to sensitive sites. Saddam agrees to allow inspectors to visit eight disputed "presidential sites" with diplomatic escorts. In December, Saddam ends Iraqi cooperation with UNSCOM and accuses the U.N. of espionage. On Dec. 15, UNSCOM Chairman Richard Butler reports that the Iraqis are refusing to cooperate with inspectors and the next day, President Clinton -- on the eve of the House impeachment vote -- orders Operation Desert Fox, a four-day bombardment of key Iraqi military installations. It is conducted without U.N. Security Council approval. In his address to the nation on the evening of Sept. 11, President George W. Bush announces that the U.S. will "make no distinction between the terrorists who committed these acts and those who harbor them." The war council votes with Powell; Secretary of Defense Donald Rumsfeld abstains. The president ultimately decides that the war's first phase will be Afghanistan. The question of Iraq will be reconsidered later. Bush's speech to Congress builds on his address from the night of Sept. 11. "We will pursue nations that provide aid or safe haven to terrorism," he declares. "Every nation, in every region, now has a decision to make. Either you are with us, or you are with the terrorists. From this day forward, any nation that continues to harbor or support terrorism will be regarded by the United States as a hostile regime." Bush's speech also outlines the beginnings of what becomes known as the "Bush Doctrine" -- a vision for a strong American leadership in the world that would project the nation's power and influence. "Freedom and fear are at war," he says. "The advance of human freedom -- the great achievement of our time, and the great hope of every time -- now depends on us. Our nation -- this generation -- will lift a dark threat of violence from our people and our future." Responding to a reporter's question about widening the war on terrorism to include Iraq, Bush says, "There's no question that the leader of Iraq is an evil man. After all, he gassed his own people. We know he's been developing weapons of mass destruction. And I think it's to his advantage to allow inspectors back in the country." He warns, "We're watching him very carefully." Soon after the Sept. 11 attacks, an influential group of former government officials, known as the Defense Policy Board, is convened at the Pentagon. The group, chaired by Richard Perle, is determined to keep the administration focused on Iraq. The board hears the bill of particulars -- a litany largely unproven in the specific, but to them powerful in the aggregate -- about Saddam and his involvement with terrorists. The one charge that gets the most serious attention in Washington is Saddam's desire to possess weapons of mass destruction. "Iraq continues to flaunt its hostility toward America and to support terror. The Iraqi regime has plotted to develop anthrax, and nerve gas, and nuclear weapons for over a decade. This is a regime that has already used poison gas to murder thousands of its own citizens -- leaving the bodies of mothers huddled over their dead children. This is a regime that agreed to international inspections -- then kicked out the inspectors. This is a regime that has something to hide from the civilized world." "We'll be deliberate, yet time is not on our side. I will not wait on events, while dangers gather. I will not stand by, as peril draws closer and closer. The United States of America will not permit the world's most dangerous regimes to threaten us with the world's most destructive weapons." Powell reports trouble getting U.S. allies on board for a war with Iraq and wants to consult the U.N. At a private dinner with the president on Aug. 5, Powell warns that the U.S. should not act unilaterally and must fully consider the economic and political consequences of war -- particularly in the Middle East. Powell's view is championed by Brent Scowcroft, former national security adviser in the Bush I administration, who publishes an op-ed in The Wall Street Journal on Aug. 15, Scowcroft argues that Bush is moving too quickly on Iraq, and advocates pressing for the return of U.N. inspectors. Soon after, Vice President Cheney emerges as the administration voice advocating action. In a Nashville speech to the Veterans of Foreign Wars, Cheney warns that "a return of inspectors would provide no assurance whatsoever of [Saddam's] compliance with U.N. resolutions." "Regime change in Iraq would bring about a number of benefits to the region. When the gravest of threats are eliminated, the freedom-loving peoples of the region will have a chance to promote the values that can bring lasting peace. As for the reaction of the Arab 'street,' the Middle East expert Professor Fouad Ajami predicts that after liberation, the streets in Basra and Baghdad are 'sure to erupt in joy in the same way the throngs in Kabul greeted the Americans.' Extremists in the region would have to rethink their strategy of Jihad. Moderates throughout the region would take heart. And our ability to advance the Israeli-Palestinian peace process would be enhanced, just as it was following the liberation of Kuwait in 1991." In the United Nations speech, Bush calls for a new U.N. resolution on Iraq. But the president also warns: "The purposes of the United States should not be doubted. The Security Council resolutions will be enforced -- the just demands of peace and security will be met -- or action will be unavoidable. And a regime that has lost its legitimacy will also lose its power." Twenty months into his presidency, George W. Bush releases his administration's National Security Strategy (NSS). It is the first time the various elements of the Bush Doctrine have been formally articulated in one place. The 33-page document presents a bold and comprehensive reformulation of U.S. foreign policy and outlines a new, muscular American posture in the world -- a posture that will rely on preemption to deal with rogue states and terrorists harboring weapons of mass destruction. The document says that America will exploit its military and economic power to encourage "free and open societies." It states for the first time that the U.S. will never allow its military supremacy to be challenged as it was during the Cold War. And the NSS insists that when America's vital interests are at stake, it will act alone, if necessary. Read experts' analysis of the Bush Doctrine. The resolution is adopted by a unanimous vote of the Security Council. It warns of "serious consequences" if Iraq does not offer unrestricted access to U.N. weapons inspectors. After a lapse of four years, the U.N. finally resumes weapons inspections in Iraq on Nov. 27. But almost immediately after the U.N. resolution is passed, diplomats start disagreeing on whether the use of force is justified if Iraq doesn't comply.